Join artists André Sousa and Mauro Cerqueira, curators of the project space, Uma Certa Falta de Coerência (A Certain Lack of Coherence), based in Porto, Portugal, for a conversation about curating and showing contemporary art in alternative spaces. The co-organizers of the MCASB exhibition Bloom Projects Exchange Series: Silvestre Pestana, Breathless will give a presentation on their space, which was founded in 2008 and has featured more than 70 exhibitions, discussing its history and relevance in Porto and the broader international arts community. The conversation will then be opened up to local artists, curators, and art enthusiasts to ask questions and dialog with Sousa and Cerqueira. Mauro Cerqueira (b. 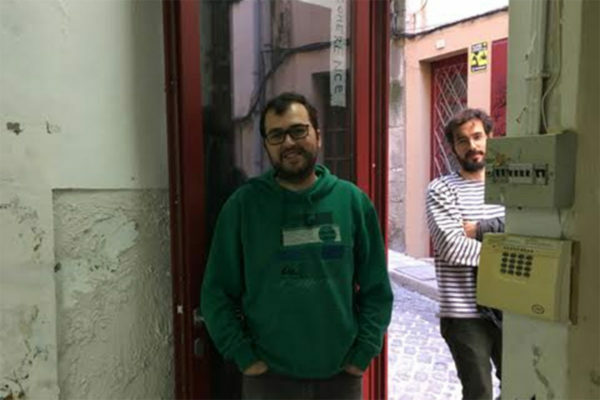 1982, Guimarães, Portugal) co-founded the artist-run space, Uma Certa Falta de Coerência (A Certain Lack of Coherence) in Porto, Portugal, with André Sousa, where since 2008 they have organized over 75 exhibitions. As an artist, he has concurrently had solo shows at Museum of Contemporary Art Vigo, Pontevedra, Spain; Künstlerhaus Bethanien, Berlin, Germany; and Kunsthalle Lissabon, Lisbon, Portugal; and group shows at Museum of Art, Architecture, and Technology (MAAT), Lisbon, Portugal; Museum of Contemporary Art Serralves, Porto, Portugal; Galeria Casa Triângulo, São Paulo, Brazil; and Fondation Calouste Gulbenkian, Paris, France, among others. He has been in residence at Rauschenberg Foundation in Captiva Island, Florida, (2013) and Künstlerhaus Bethanien, Berlin (2011). Cerqueira received his postgraduate degree in Arts/Drawing at Escola Superior Artística do Porto (Guimarães, Portugal). He is based in Porto, Portugal. André Sousa (b. 1980, Porto, Portugal) is an active member of Porto’s artist-led scene, co-founding projects that include PêSSEGOpráSEMANA (2002/07); Mad Woman in the Attic (2005/09); and Uma Certa Falta de Coerência (2008, with Mauro Cerqueira). He has participated in residencies at Casa do Povo (São Paulo, Brazil); Künstlerhaus Bethanien (Berlin, Germany); and Spike Island (Bristol, UK) where he was a Fundação Calouste Gulbenkian grantee. Sousa’s work has been included in numerous exhibition venues including Contemporary Art Centre, Riga, LV; Binz39, Zurich, Switzerland; Museum of Contemporary Art Serralves, Porto, Portugal; Kunsthalle M3, Berlin, Germany; and Centro Cultural Franco Moçambicano, Maputo, Mozambique. He studied Visual Arts/Painting at Faculdade de Belas Artes da Universidade do Porto (1998/2003). Sousa lives and works in Porto, Portugal and Frankfurt am Main, Germany.